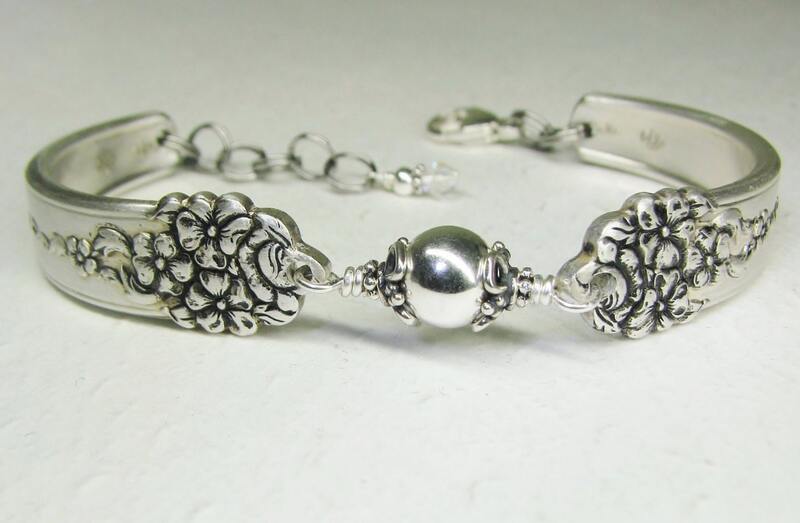 Actual Wrist Size 5.5" 5.75" 6" 6.25" 6.5" 6.75" 7" 7.25 7.5" 7.75" 8"
This beautifully patterned, silver spoon bracelet was created from two sterling plated vintage teaspoons. The pattern is 'Moss Rose' from 1949. 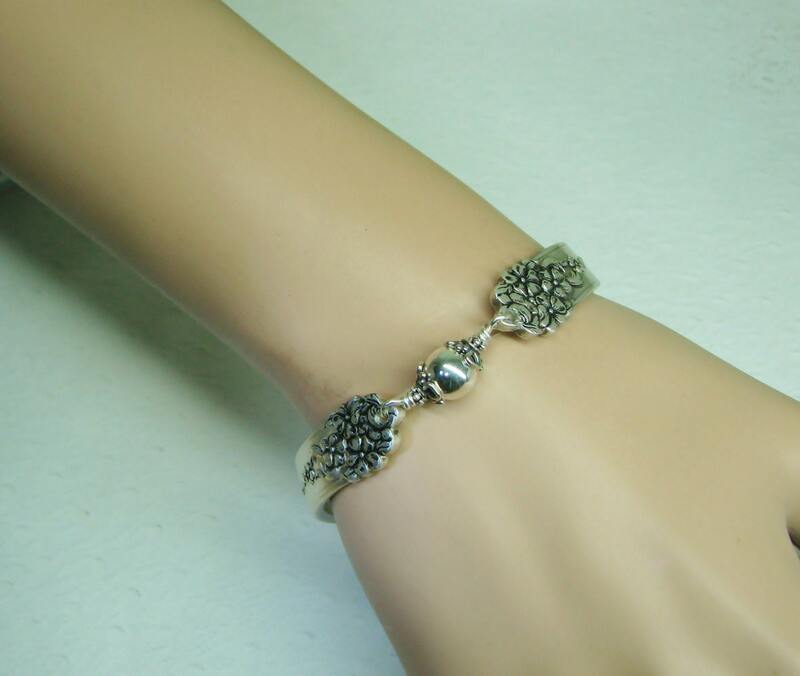 This bracelet is elegantly embellished with an 8mm sterling silver bead; nestled between sterling silver bead caps, and twists of silver wire. 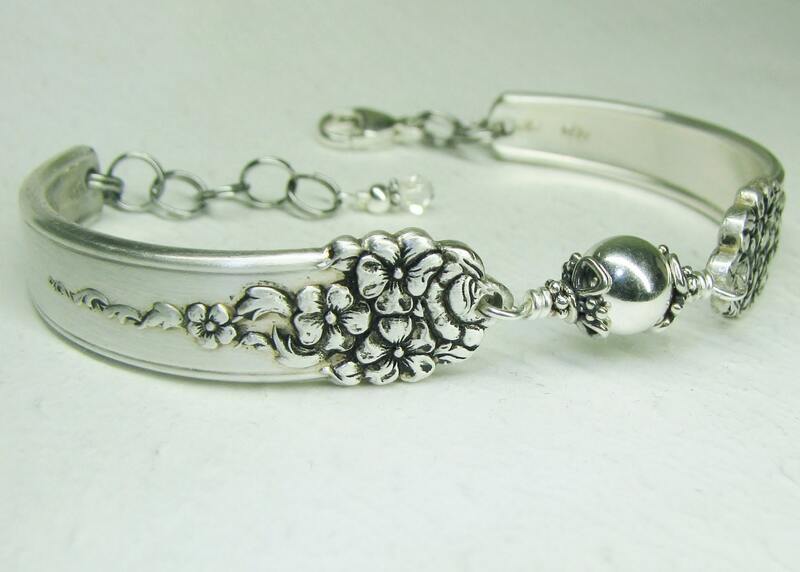 The spoon bracelet is finished with a sterling silver lobster clasp. There are also extra rings so you can wear it where it's most comfortable, and they're topped off with a smaller sterling silver and AB crystal bead at the end. All rings used are 'split rings' for security. Nothing to fall apart. 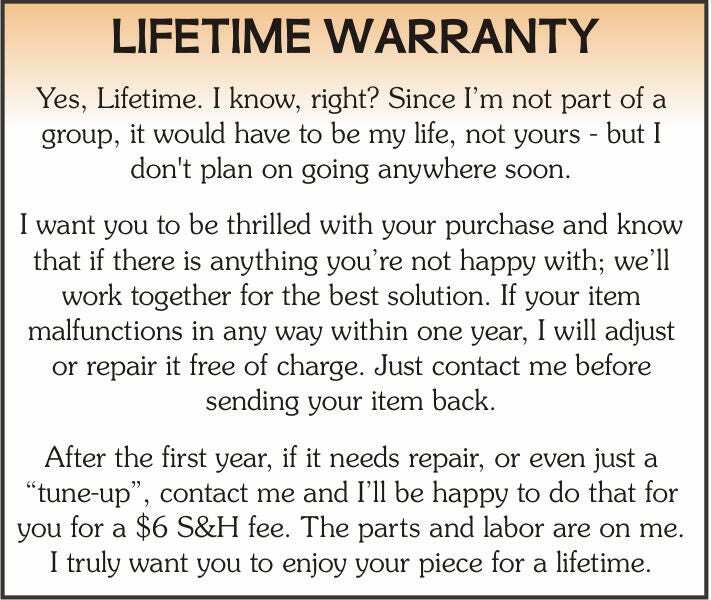 For a truly custom fit, you'll be prompted at checkout to provide your wrist measurement so I can fit your bracelet just for you. For instance, if your wrist is 7" or more, it will be more comfortable for you if I bend the spoons 'out' a bit to accommodate a larger bone structure. If your wrist is smaller, I'll re-cut and bend the spoons a bit smaller. 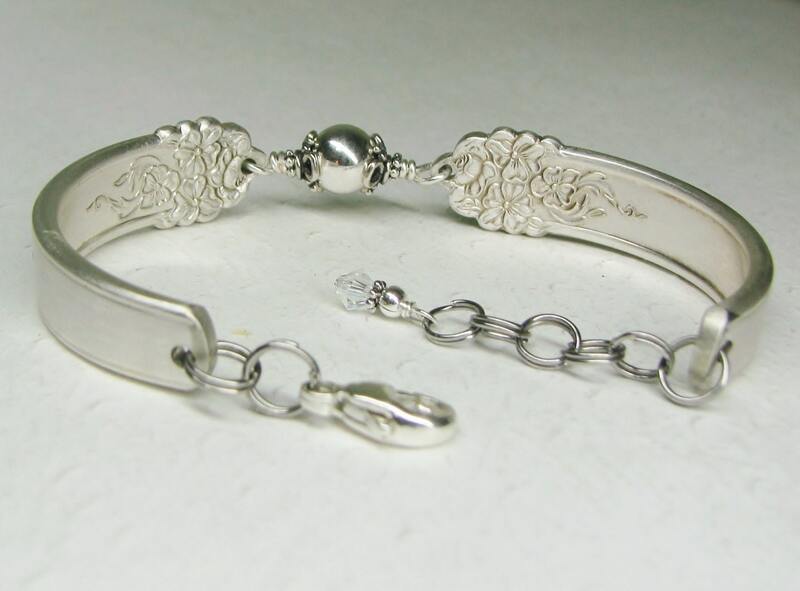 Everyone, no matter what size you are, can have a truly custom fitted spoon bracelet. This nostalgic piece of spoon jewelry will arrive in a festive organza gift bag, along with a Spoonfest Jewelry story card, and pattern/date of the spoons. Plus, tucked in your pouch will be a coordinating bracelet helper tool to make managing your lobster clasp easy. I love this bracelet! It's exactly what I wanted. It's perfect. The packaging was lovely and it shipped quickly. I'm very happy with this purchase. Beautiful - excited to give my daughter this as a gift. She will love it. Thank you! Beautifully made! 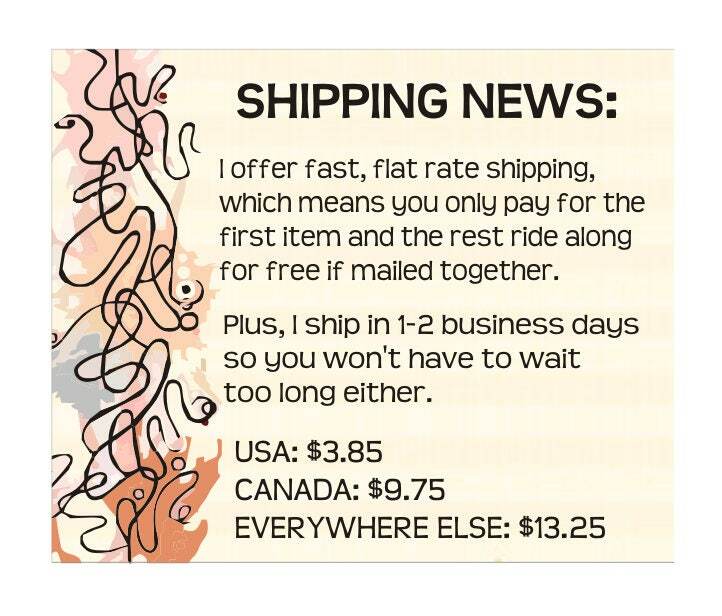 Incredibly fast shipping! All around great experience!!!!! Definitely recommended!